The Basilica of the Sagrada Familia in Barcelona has extended the tour for visitors with the opening of the ground floor of the sacristy of the west, he has informed the board of trustees of the temple. In the space of the cloister it has placed the ‘Way of the Liturgy’, an exhibition of pieces Antoni Gaudí designed for the Catholic liturgy. The pieces are tenebrario wrought iron candlestick two feet, a cross with candles, a lectern three sacral, a mobile chair two couches, three banks and a chair. Moreover, within the sacristy there are two closets: one to keep the liturgical vestments worn by the celebrant and ministers of celebrations and another for the various liturgical objects such as chalices and patens. All parts that are part of the Way of the Liturgy are original or reproductions of designs by Antoni Gaudí. 37.5 meters high, on top, already it placed the bronze crown and base ring surrounding the tallest stone dome and dice glass domed give light to the interior space. We have also installed own symbolic details of this building: lamb and vendimiador represented with four medallions of 1 meter and 60 centimeters in diameter; two facing the street and two inland. The dome of the sacristy is made with stone from Montjuïc, but the Rams are reddish porphyry, to represent splash of wine or blood. According to the Board, to complete the iconographic program outside the sacristy still be missing other artistic details like the palms of bronze, which will be put down as dismantling the scaffold. Those responsible for the temple reminded that this building is very important for the study and projection of the towers, since it has the same structure, but with other parameters. The upper floors of the sacristy will go to office and uses least one plant to the parish. 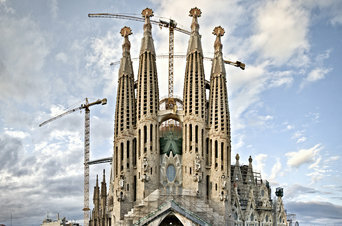 The chief architect of the Sagrada Familia, Jordi Faulí, planned on Wednesday at the new Creuer Hall of Barcelonian basilica, of the temple designed by Antoni Gaudí, than will be completed in 2026. In a press conference to show progress in the work of Gaudí, Faulí explained that in 2016 will begin the construction of the upper part of the central towers, namely, that of Jesus Christ, Mary and the four Evangelists. However, the chief architect stressed that “these central towers begin to be visible only from the outside since 2017, and will end altogether in 2020, still lacking the pinnacles”. The event was held at the Creuer Chamber of the Sagrada Familia, a new space that is at the basis of what will be the tower of Jesus Christ, so just above the main hall of the building, to be used for purposes explanatory in tourist visits. The Basilica of the Sagrada Familia held from 23 to 25 October open house and for those who have exhausted the 30,000 tickets made available to the citizens free to visit the temple. The planned open day will be organized in different slots between 16 and 20 hours, and the temple has created a video in which emphasizes that begins the work of its central towers. Say the users of TripAdvisor, which also stand out among the Spanish monuments La Alhambra and Casa Batllo. The Sagrada Família has snuck back in the top of the world ranking on the best places in the world, according to TripAdvisor users, the community of the world’s largest travel site. Specifically this year Gaudí’s basilica stands in fifth place worldwide from Travellers Choise list and the first in Europe. The Alhambra in Granada is placed in 14th place worldwide and the seventh in the ranking of Europe. “Must Visit”, “spectacular”, “amazing architecture” … These are some of the adjectives that people use to describe the temple designed by Antoni Gaudí and which now receives more than three million visitors a year. Some visitors this year have placed the modernist basilica in the best place in Europe and fifth in the world, behind only the temple of Angkor Wat in Cambodia, the town of Machu Picchu in Peru, the Taj Mahal in India and the mosque Sheikh Zayed of Abu Dhabi. The Travellers Choice Awards recognize this year more than 712 sites of interest around the world, including listings in Africa, Asia, Caribbean, Europe, South America, South Pacific, UK and USA The European list, headed by the Sagrada Familia and followed by Sant Peter’s Basilica in Rome and the Duomo in Milan, also includes the Alhambra in Granada at 7 and Casa Batllo at number 16. As for the list that rewards the best Spanish interest, the ranking is headed back the Holy Family, followed by the Alhambra and Casa Batllo. Ranked 4th in the mosque of Cordoba followed by Spain Seville Square is located. Interestingly, Russian users are the biggest fans of Spanish monuments and stand out from other nationalities when it comes to value them. Curiously, the Russians lead the best rating in places such as Casa Batllo and Palau de la Orpheus Music in Barcelona Cathedral and Mosque of Cordoba, Spain Square, the Cathedral and the Alcázar of Seville and the Royal Palace Madrid. Other nationalities also noted for their high ratings to sites of interest are the Costa Rican Spanish, Australian, Chilean, Mexican, Colombian, Ukrainians, Romanians, Austrians, Puerto Rican and Turkish, among others. The annual Travellers Choice Awards are based on millions of reviews and opinions from TripAdvisor travelers worldwide. The winners were determined using an algorithm that takes into account the quantity and quality of comments to the sights of the world, for a period of 12 months. Currently the site has over 225 million views and comments on over 4.9 million lodgings, restaurants and places of the world. “The use of public clock back to the fourteenth century and had a purpose of organizing social life. Markets, and out of the city, hours of closing doors, etc. And all that is synchronized with a clock and bell tower, usually by the council, “says Eduard Farré, professor and historian of watchmaking. Barcelona has time public since 1410 thanks to the clock tower of the Cathedral of Barcelona, ​​located in the Plaza Nueva. Despite being the basilica, the local clock is still preserved today and the first machine to MUHBA. The current machine is the nineteenth century and the clock works with two bells, one larger than the hour mark and the other smaller than the quarter mark. The Royal Academy of Sciences and Arts is responsible for giving the official time in the city. It was thanks to an initiative by Josep Ricart and Giralt, thanks to their motivation to improve navigation and got RACAB the City Council signed an agreement in 1891. The clock is located on the main façade the building of the Royal Academy, La Rambla, 115. It is the undisputed symbol of Vila de Gràcia. Located in the Plaza de la Villa, the tower was designed by the architect Antoni Rovira i Trias and was built between 1862 and 1864. The famous bell Grace, who plays the hours in the town, he acquired a symbolic resist after a heavy bombardment during the Revolt of the Quintas, 1870. Barcelona is full of curious watches. A good example is the clock lights located in Rocafort, 2 and Juan Cabrerizo built in 1929 for the International Exposition in Barcelona. 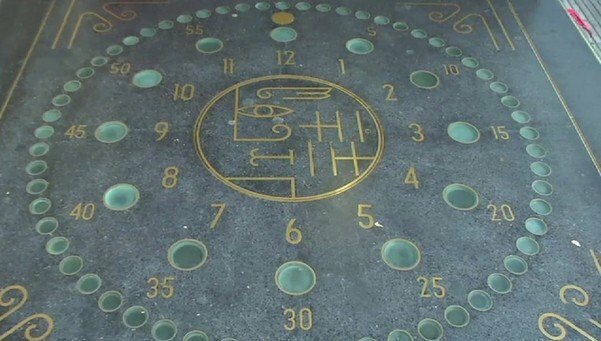 This clock, placed on the ground, has some areas that are lit to mark the hour. Also curious if the siphon Clock located on Avenida de Roma, 105 and was built in 1960 as an advertisement for the owner of the factory siphons Puértolas. Finally, you can also find different sundials town. This is the case of the four that are in the Church of the Virgin of the Angels, Street Balmes, 78 and dating from 1955. The new educational project of the Sagrada Familia uses new technologies, games and puzzles, to capture student interest. The new range of educational visits of the Sagrada Familia aims to guide students toward a discovery of the temple from their own lived experience. With this new style of visits to guide students opt instead to explain retail Basilica. In addition, we have incorporated digital tablets as educational tools with which students complete games and consult teaching units in the same visit. According to the coordinator of the educational project of the Basilica of the Sagrada Familia, Maite Martínez, “these visits give hints and clues for students to discover the key to understanding both exceptional elements of the architecture of Gaudi. If you discover that the relationship with the building will be absolutely unconditional. Thus, through appropriate teaching materials for each level (for secondary tablet, tool belt and story for Primary and large format book for children) the student learns and solves the riddles posed concepts related to the work of the Catalan architect. For example, before the Passion facade, must find the different elements Subirachs sculpted in tribute to Gaudi. Inside the basilica, a game teaches geometry layout and shape of the columns. And to understand the light within, the tablet virtually reproduces the shape of the hyperboloid that the architect wanted to use to illuminate the basilica.